With Sage ERP Accpac 6.0A we have incorporated Web based versions of the Accpac Order and Quote entry screens into SageCRM. These are the first accounting document entry screens in the new Accpac Sage Web Toolkit (SWT) technology. A common question I get asked is how to customize these screens. Certainly the regular current Accpac Order Entry screen is one of the most customized screens in the Accpac system. However it is very hard to customize the current screen when it’s run from SageCRM because of the way it is packaged and run from a CAB file. The new screens are regular Accpac screens and run inside SageCRM just like they would run from Accpac. This means all the regular customization techniques for the new web based technology can be used on them. The XML file is located in the folder: C:\”Program Files (x86)\Common Files\Sage\Sage Accpac\Tomcat6\portal\swtServices\uiDefinitions\oe60a\eng\sagecrmorderui”. The file we will look at is SageCRMOrderUIUIDefinition.xml. The XML files for a couple of popup forms are here also and you can customize these also. You can edit these files in any text or XML editor. If you have the SDK you can edit these files in a visual SWT UI designer, however for the purposes of this blog posting we will assume you don’t have the SDK and edit this file directly as a text file. One nice thing about the new web based technologies is that they are entirely configured by XML files, which being text files can easily be edited for customization purposes. First just a few notes about XML. It’s worth your while to check out a site like http://en.wikipedia.org/wiki/XML to learn the basics of XML. But for what we’re doing here you really don’t need to know very much, just how to find things, cut and paste things, and make minor changes. Where the closing tag is the opening tag with a / in front of it. Generally most of the other stuff you find in the XML file, you would leave alone, like the version and encoding and such. We talked a bit on how to layout forms in https://smist08.wordpress.com/2010/05/28/how-to-layout-forms-in-sage-erp-accpac-6/. So we won’t talk too much about how to control the layout here, but we may look at this more in depth in a future posting. But beware that there are two types of widgets in a screen definition file, there are layout widgets that control how things look and then data widgets for displaying/editing data. A widget element must contain a “type” attribute (corresponding to the namespace-qualified class name of the widget). It may contain other attributes such as an ID as well as other attributes corresponding to simple properties (such as “enabled”). A widget element may also contain other elements that correspond to compound properties. These compound properties include action (for predefined actions associated with button-like widgets), translatable display string properties such as caption, column headers (for tables), images (which include the URLs to the normal, normal, mouseover, and disabled images for a widget), search fields (for finders) and selectable items (for list boxes). A “regular” container (“HasWidgets”) widget’s element contains a “children” element. That “children” element in turn contains a list of widget elements for child widgets. A grid-type container (“HasWidgetsInGrid”) widget’s element contains a “rows” element. That “rows” element in turn contains a list of “row” elements, each of which contains a list of “cell” elements. Each cell is either empty or contains one (child) widget element. A dock panel widget’s element contains a “dockedWidgets” element. That “dockedWidgets” element in turn contains a set of docking position elements (e.g. “northWidget” element) for north, south, east, west, and center (in that order). Each docking position element is either empty or contains one (child) widget element. A menu bar or menu button widget’s element contains a “menuItemList” element. That “menuItemList” element in turn contains a list of “menuitem” elements, which in turn may contain other “menuItemList” elements (representing submenus). This is the contents for the base structure of a widget element. These are the elements we customize. Once we save this change, then running the Q2O Order Entry screen will show this caption instead of the one from the Portal database. 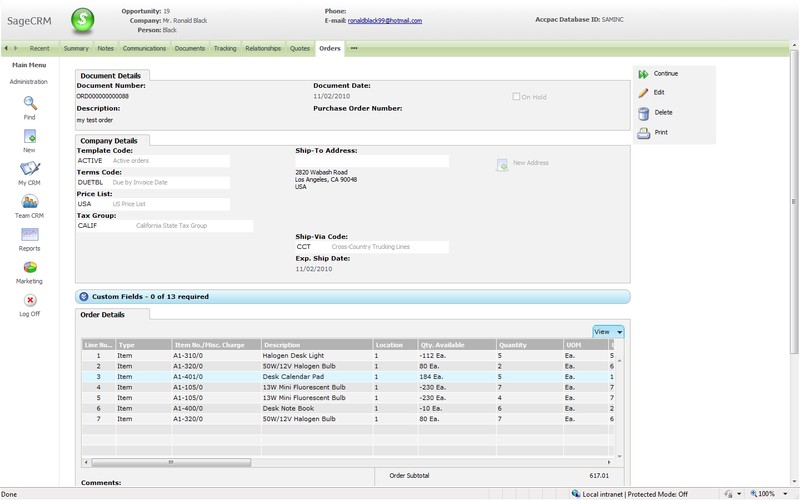 The Quote to Order screen is optimized to make it easy for salespeople to enter orders quickly. However suppose the form is too simple and you require your sales people to enter another field that isn’t already on this screen. In the Q2O screen there is the order description field, but no order reference field. So let’s add the reference field to the Document Details tab. To do this, find the SwtSingleTabPanel with transText: oe60a_sagecrmorderui_pnlDocDetails. A couple of lines below this is a SwtGridPanel with a rowCount of 4, change this rowCount to 6 (since we are adding one row with the label and one with the textbox. This will add the REFERENCE feed to the header. Make sure you add this to the includeFields for the header and not one of the details. Whenever you change one of the SData definition files, you need to restart Tomcat to have it take effect. After you do this you should see the new field on the form and be able to set and edit it. Hopefully this starts to give some idea of how to customize the new screens. If you have the SDK then you can use the SwtUIDesigner to edit these forms; but, hopefully in future versions the visual screen designer will be included in the main product making this process much easier for non-SDK partners to customize. But at least for now, once you get used to XML you can do a lot of customizations to the current Web based version 6.0A screens. Sage ERP Accpac 6.0A comes with a new Web Portal (https://smist08.wordpress.com/2009/12/03/the-sage-erp-accpac-6-0a-portal/) along with Web based screen integration to SageCRM (https://smist08.wordpress.com/2009/12/17/sage-erp-accpac-6-0-quote-to-orders/). A common question is how I set this up in a secure manner so that these new features won’t be exploited by hackers. Most people will probably just setup Accpac 6.0 and/or SageCRM running on their local network. If you don’t expose the web server to the internet, then your security concerns are the same as they are today. You are just regulating what bits of information your local users are allowed to see. Generally (hopefully) you aren’t as worried about your own employees hacking your network. The big concern for security here is usually social engineering (http://en.wikipedia.org/wiki/Social_engineering_(security)) which really requires good education to prevent. Note however that we have seen sites where people have added Internet access for all their employees, but unwittingly exposed their network to the Internet. It’s never a bad time to re-evaluate your current security to see if there are any weaknesses. For Sage ERP Accpac 6 we’ve taken security very seriously and are involving security consideration into all parts of our Software Development Methodology. Additionally we commissioned a third party security audit of our product. From this audit we then made a number of changes to tighten up our security further. This way we’ve been looking for and being careful about SQL Injection attacks (http://en.wikipedia.org/wiki/SQL_injection) and cross site scripting attacks (http://en.wikipedia.org/wiki/Cross-site_scripting), among others. Then you can develop plans to protect your assets and to watch for your adversaries. A lot of security isn’t a matter of being perfect, just being better than others. This way hackers will come across your web site, quickly see it has security in place and then move on to easier targets. Hackers tend to employ automated scripted scanning tools to search the Internet for unprotected servers (http://en.wikipedia.org/wiki/Port_scanner), just starting by being HTTPS and not having any other ports open, sets the bar quite high for hackers and the scanning tool will keep scanning. A great tool to test if any ports have been left open is Nmap/Zenmap (http://www.nmap.org/). You run this tool from outside your network (perhaps from home) to see what ports are visible to the Internet. Below is a screen shot of running this tool against www.yahoo.com. We see that ports 80 and 443 are open as expected but so are ports 25 and 53 (which are for email authentication and DNS). Since there are 4 ports, as a hacker if I have an exploit for any one of these I can give it a try. Obviously the fewer ports open, the better. Ideally only port 443 for HTTPS (though port 80 is often left open to give a better error message to use HTTPS or to redirect people to HTTPS automatically). Now with your site protected so the only thing that can be attacked is the web site, we need to ensure it is only accessed in a secure manner. As a first step we only access it through HTTPS. This encrypts all communications, ensuring privacy and validates that users are talking to the right server avoiding man-in-the-middle attacks (http://en.wikipedia.org/wiki/Man-in-the-middle_attack). To turn on HTTPS you need a server digital certificate. If you already have one, then great you are all set. If you don’t have one then you can purchase one from companies like VeriSign (http://www.verisign.com/). If you browse the Internet there are many other recommended IIS settings, but generally Microsoft has done some good work making the defaults good. For instance by default virtual directories are read-only so you don’t need to set that. Also remember that Accpac doesn’t store any valuable data in IIS, Accpac only stores some bitmaps, style sheets and static html files here. So if someone “steals” the files in IIS, it doesn’t really matter, this isn’t where your valuable accounting data is stored. We just want to ensure someone can’t vandalize your web site by uploading additional content or replacing what you have there. The valuable data is stored in the database and only accessible through Tomcat, not directly from IIS. 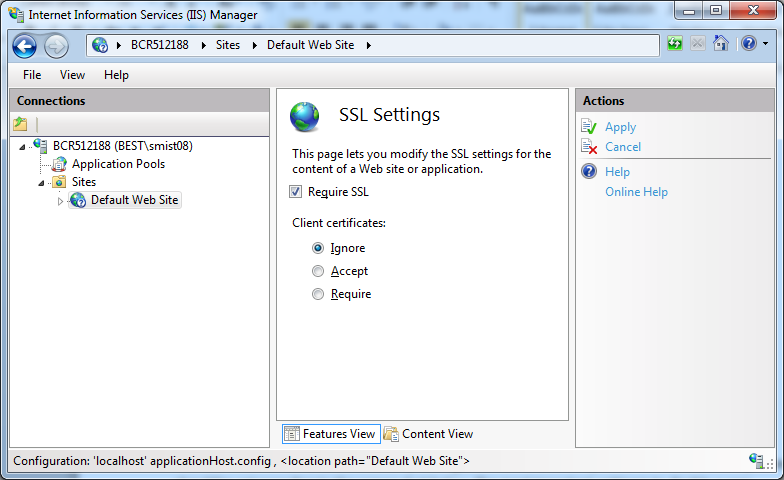 The new Web Portal honors the security settings, set from the Security button in Database Setup. These should be set according to the screen shot below. 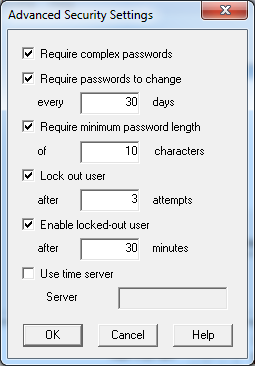 The most important setting is to disable a user account after x failed password attempts. This prevents automated programs from being able to try every possible password and eventually guessing the correct one. With the settings below and automated program can only try 3 passwords every 30 minutes which will usually get the hacker to move on to find a less secure site to try to hack. We’ve talked a bit about how to install and deploy Sage ERP Accpac 6.0A: https://smist08.wordpress.com/2010/10/02/installing-and-deploying-sage-erp-accpac-6-0a/. When deploying for real you usually have several computers involved, usually a file/web server, a database server and then client workstations. This distributes the total workload over at least three computers, including memory used and processing requirements. But what if you want to demo all the new web components of Accpac 6 on a single self-contained laptop? Here you want everything installed on the laptop and ideally not even require an Internet connection to do the demo. You want the demo to run well, be quick and look good. Fortunately this isn’t hard to set up. Of course the most important part of a good demo is to tell a compelling story and to involve the customer. To show him how he can save time and money and get work accomplished quicker and more pleasantly. This blog posting doesn’t help with that part, this posting just talks about a number of technical issues to avoid, allowing you to give your demo without anything getting in your way. Microsoft did a really good job with Windows 7. It fixes most of the bugs from Windows Vista and is ten years more advanced than Windows XP. The bottom line is that Accpac 6 runs twice as fast on Windows 7 as it does on Windows XP. To have a good demo you really want to take advantage of this. If you only take away one tip from this blog posting, let it be this one. The biggest thing that will make the demo better is to use Windows 7. Further use the 64-Bit version. This allows you to add more memory effectively past 2Gig of RAM. At 2Gig of RAM both the 32 and 64 bit versions run about the same, but with the 32 bit version you can never effectively use more RAM. The 64 bit version lets you expand the RAM to your laptop’s full capacity. You cannot use a Home edition of Windows to demo with. 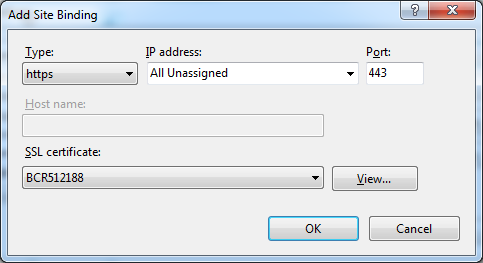 Both Accpac and SageCRM require IIS be present and this is not available for the Home versions of Windows. You only want to have one database server running, so use SQL Server. Best to use SQL Server 2008 R2 (may as well use the newest). Since you will probably want other products like SageCRM installed, the common database is SQL Server. SQL Server 2008 is 10-15% faster than SQL Server 2005, so it isn’t the end of the world if you use 2005. If you are using 32-Bit Windows then 2Gig is your limit. You won’t get any benefit having any more memory. Accpac 6 will run fine here, but if you are running through a lot of things, it really helps to have 4Gig of RAM, which is pretty standard these days in laptops. And again to use 4-Gig of RAM properly you need to be running a 64 Bit version of Windows (preferably Windows 7). For demo purpose the CPU doesn’t make much difference, as long as it isn’t too old. Paying more for a CPU will get you a bit better speed and better multi-threading. Multi-threading is very important for a production server handling many users, but for a single user doing a demo it doesn’t make much difference. That being said if the price difference isn’t too great it doesn’t hurt to be running an Intel i5 or i7 CPU (http://en.wikipedia.org/wiki/Intel_Core). Unfortunately laptop screens tend to be wide but not high. There isn’t much you can do about your laptop’s screen. Most have pretty good resolution but tend to be small. I expect most people will demo using an LCD projector. For some reason when Windows attaches to an external projector it tends to reduce the resolution quite a bit for no reason. The thing to remember is after switching to the projector, go and adjust your screen resolution to the highest setting you can. 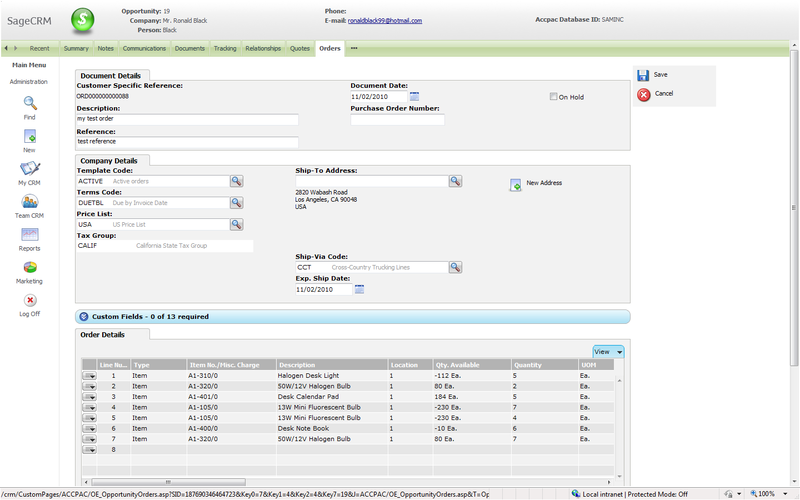 One of the biggest new features in Accpac 6.0 is the new SageCRM (http://www.sagecrmsolutions.com/Products/SageCRM) integration called Quotes to Orders. Here you get Accpac Quote and Order screens running inside CRM as web pages. This works far better than previously having the Order Entry VB OCX popping up. There is no problem installing both Accpac and SageCRM on the same laptop for demo purposes. This is why earlier I recommended using SQL Server so both can share the same database service. When demo’ing, it’s well worth “warming up” the system before demo’ing it. Web servers expect to be running for a long time and aren’t necessarily optimized for starting quickly. If you run the portal and CRM for the first time when no one is looking then things will go much quicker during the actual demo. This isn’t a case we are going to optimize since in a real environment (hopefully) the web server is reset very infrequently, maybe only for Windows Updates. However laptops are always being turned off and on (see the section on changing IP addresses below). Virtual images have been a great way to demo in the past. However Accpac 6 runs very slowly in a virtual image on a laptop whether its VMWare (http://www.vmware.com/) or VirtualPC (http://www.microsoft.com/windows/virtual-pc/). Partly this is because virtual images always have less memory than the host computer and partly because of the extra layers involved in accessing the hardware (like the hard drive). So the advice here is to not demo from a virtual image. Have Accpac 6 installed directly on the laptop. Accpac 6 requires a number of web server processes to run including IIS and Apache Tomcat. These programs were designed to run on servers, which typically don’t move around much and have fixed IP addresses. These programs really don’t like network changes. Even moving around the different WiFi zones of an office can cause them to get “confused” and stop working. The safest way to run is to either have networking turned off, or turn on your computer from scratch at the location of the demo. I’ve also experienced that intermittent WiFi can cause pauses in computer operation, so if the WiFi isn’t reliable, turn off the laptop’s radio. If you do have to move around and things stop working then you need to stop and start the IIS and Sage Accpac Tomcat Windows services. I’ve heard SSD Drives (http://en.wikipedia.org/wiki/Solid-state_drive) can make a big difference, but I don’t have one, so I can’t speak from experience. If you have one give it a try, I suspect it will really help. My primary advice is to use a laptop running Windows 7 64-Bit with at least 4Gig of RAM. With this you will be well positioned to give a great demo. Plus turn the computer on from scratch and warm it up. Any of the other things mentioned here, will help, but won’t have nearly as big and effect. Sage ERP Accpac Business Logic objects are called Views. With these Views you can use various interfaces to input data, retrieve data, perform calculations or perform business processes. The interface to every View is the same and this allows us to offer many different interfaces to the Accpac Business Logic (see: https://smist08.wordpress.com/2010/09/18/a-short-history-of-the-accpac-view-interface/). The Views in this posting are to do with entering and reading O/E Orders. Each View sits on a corresponding database table. Below are some of the Views and tables that make up an order. These Views then work together to manage Orders. These Views form header/detail relationships with each other and Accpac has standard protocols for manipulating header/detail Views. These are documented in the macros section of the System Manager User Guide. You don’t need to use all the Views all the time. If you aren’t using serial numbers or lots then you don’t need to worry about those Views. Mostly you use the Order Header and Order Details Views. To make the Views work together you need to compose them. You can get the list of Views that compose together from SDK tools, the Application Object Model on our Web site or you can get the code generated for you by recording a macro. These Views manage the data in the database. They ensure data integrity is maintained. They control security. But additionally they will do calculations. For instance you can ask the order header calculate taxes or do a ship all. Insert/update or delete which ever detail lines you are dealing with. Update or Insert the header record. Nothing is actually done to the database until you insert or update the header. Until this is done all changes are maintained in memory. Then when you update/insert the header, all changes are written to the database in a single database transaction. This ensures the database’s integrity is maintained where the details always match the header. This protocol also handles any multi-user situations that could arise. Although Order Entry could potentially involve 12 Views, the basic protocols and interactions all follow this simple model. The Views themselves will also report errors if you do things incorrectly. Below is the VBA source code of an Accpac macro that enters Orders into Order Entry. The code to open and compose the Views was obtained by macro recording. The code to enter 1 order was also from macro recording but then modified into functions to be made re-usable. This code uses the Accpac COM API, but if you use the .Net interface or Java JNI, then the code will be very similar with just syntax differences for the calling language. Entering orders via SData would be quite different since you just provide the data in an SData XML payload, and the SData server handles all the View opening and composing automatically. The SData server then knows the View header/detail protocol and takes the data from the XML and feeds it into the Views via the algorithm indicated. The macro below enters some optional fields. There are two optional field views. One is a detail of the header, meaning that you can have any number of optional fields for each order. The second one is a detail of the order detail View, meaning you can have any number of optional fields for each order detail line. Each of these is handled using the header detail protocol, but where the detail optional fields has the order detail View has its header. 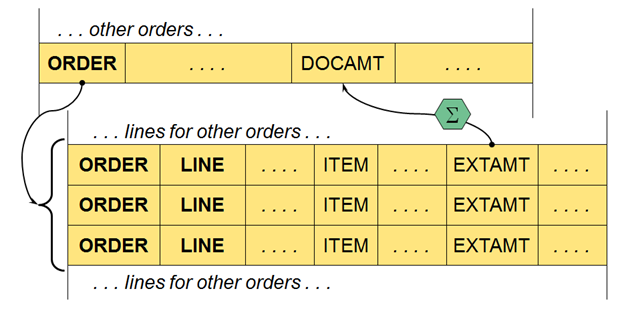 This macro shows entering orders, but exactly the same mechanisms, logic and protocols would be used to enter any header/detail document in Accpac whether in G/L, A/R or P/O. So learning to do this once has great benefit towards your second program. ‘ Global variables for database links and views that are needed in most routines. ‘ filled in automatically (A/R Shipto Locations). ‘ Open and componse the various views used in this macro. Code is straight from macro recording. ‘ Enter an order based on a number of parameters. ‘ Insert any auto insert optional fields. ‘ Set the item code and quantity. ‘ Note that all the other fields are readonly until the ITEM is set. ‘ Add the COLOR optional field to the detail. ‘ Cleanup routine destroys the COM objects in the reverse order that they were created. ‘ Simple generic error handler.